Drottning Elizabeth II, som fyller 90 år i år, är den regent som uppnått högst ålder och regerat längst. Drottningen har lyckats bygga en positiv image genom att helt enkelt inte bry sig alltför mycket om vare sig media eller ”imagebyggande”. Trots medias ständiga behov av konflikter och negativa infallsvinklar koncentrerar sig Drottningen istället på att göra det hon alltid gjort, och göra det bra. Kanske finns det en lärdom här för alla politiker och beslutsfattare? Country Life, som kallar sig för ”The voice of the countryside”, gratulerar Storbritanniens statsöverhuvud i en ledare där man också summerar hemligheten bakom hennes popularitet. 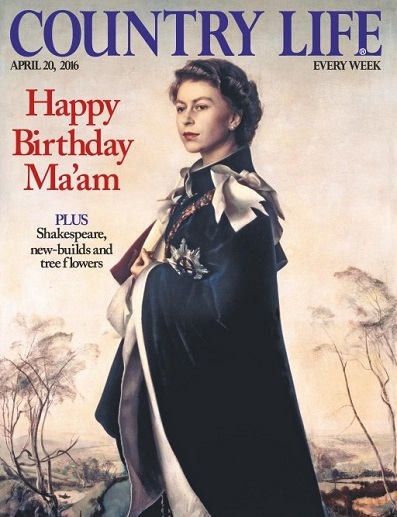 She may wield no political power, but The Queen, at 90, still has an influence the world’s leaders can only dream of. The Duke of Cambridge summed up his grandmother’s incredible reign, saying: ‘The Queen is someone who’s been there, done it, bought the T-shirt’ and his wife added: ‘I have no idea where she gets her energy from!’ Although she has lived her entire life in the media’s glare, she has never courted its attention or tried to use it to manipulate her image. Instead, she has built a foundation on the deep roots of her family and faith and dedicated herself unswervingly and tirelessly to duty. Often accused in the past of being too traditional, it is now her old-fashioned values and steadfastness that have made her someone to be admired and emulated the world over. Her long reign and vast accumulated wisdom have helped to stabilize relations across the world, especially within the Commonwealth. Detta omslag passar utmärkt vår serie ”Tidskriftsomslag vi gillar”. Bilden på framsidan (20 april, 2016) är Pietro Annigonis berömda porträtt från 1955. Media: Om fotboll och politik! FOTBOLL | När fotbollstidningen When Saturday Comes fyllde 30 passade man på att fundera över hur synen på sporten förändrats över åren. When Saturday Comes gave voice to a quizzical tone of protest at a time when the Conservative prime minister, Margaret Thatcher, believed football supporters were a hooligan mob, an ‘enemy within’, to be singled out for compulsory identity cards. Such is the transformation of the game’s status since that her successor, David Cameron, feels compelled to present as a fan himself, even when he can’t remember which club he says he supports. Politik: Donald Trump och tidsandan! VAL 2016 | ”Disintermediation” är ett uttryck som vi måste lära oss om framöver vi vill kunna förstå och tolka amerikanskt väljarbeteende. 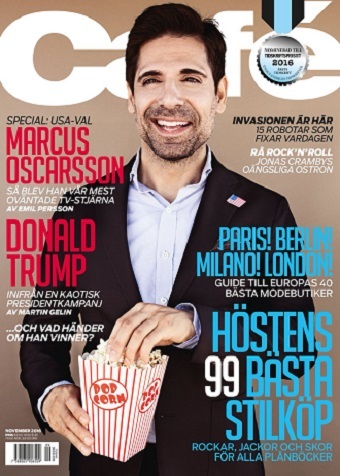 Enligt David Von Drehle på tidskriften Time är detta förklaringen till både Donald Trumps framgångar hos republikanerna och Bernie Sanders hos demokraterna. Disintermediation betyder helt enkelt att väljarna har tröttnat på att låta partiernas toppar, media och olika ekonomiska intressen tolka och lägga tillrätta vad de skall tro och tänka. Man vill nu ha det politiska budskapet direkt från källan – utan mellanhänder, spin och försköningar. Disintermediation är med andra ord en del av den nya tidsandan. Big Money, the supposed superpower of post–Citizens United politics, is a dud so far. Super-PAC bets by various billionaires have done nothing to fire up such candidates as former Florida governor Jeb Bush. Bush has filled screens in key states with millions of dollars in both positive and negative ads. The result: falling poll numbers. Touted as a front runner a year ago, Bush is mired in single digits and rang in the new year by announcing that he was scrapping a round of ads in favor of more ground troops in early-voting states. Big Media too has been brought low. 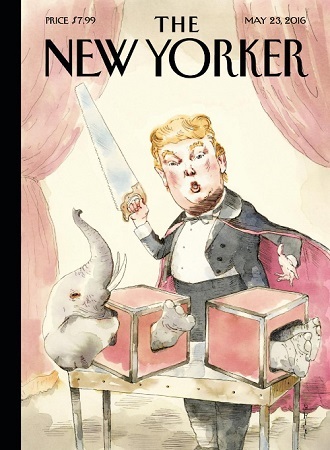 The collapse of Trump was predicted so often, so erroneously, in so many outlets that the spectacle was almost comic, like a soap opera that keeps killing off the same deathless character. Disintermediation is a long word for a seemingly simple idea: dumping the middleman. It came into use a half-century ago to describe changes in the banking business. 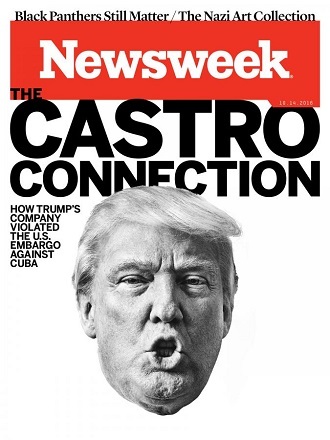 Donald Trump is history’s most disintermediated presidential front runner. 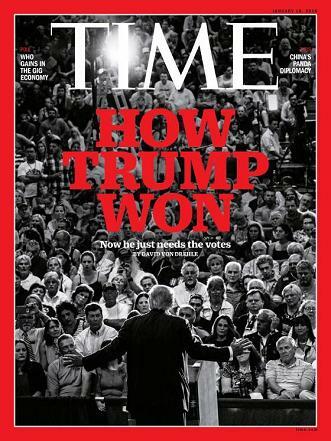 He has sidestepped the traditional middlemen–party, press, pollsters and pooh-bahs–to sell his candidacy directly to voters, building on a relationship he has nurtured with the public from project to project across decades. Indeed, the psychology of disintermediation adds another layer of protection to a figure like Trump. For members of an online network, the death of the middlemen is not some sad side effect of this tidal shift; it is a crusade. Early adopters of Netflix relished the fate of brick-and-mortar video stores, just as Trump voters rejoice in the idea of life without the “lamestream” media. Trump gets this: mocking abuse of his traveling press corps is a staple of his campaign speeches. With disintermediation, the power to set the campaign agenda shifts from the middlemen to the online networks, and those networks, this year, are very angry. Here, again, Trump is far outrunning his rivals in seizing the momentum. Americans are unhappy about an economy that punishes workers, according to opinion polls and conversations with voters. They are tired of politicians who don’t deliver on their promises. These voters don’t want someone to feel their pain; they want someone to mirror their mood. Woe to the candidate who can’t growl on cue. Perhaps nothing has hurt the Bush campaign–whose money and endorsements, lavished by middlemen, have fizzled on the launchpad–more than Trump’s observation that the former Florida governor is “low energy.” Translation: he’s not ticked off. Voter anger in this sour season is less a data point than table stakes. 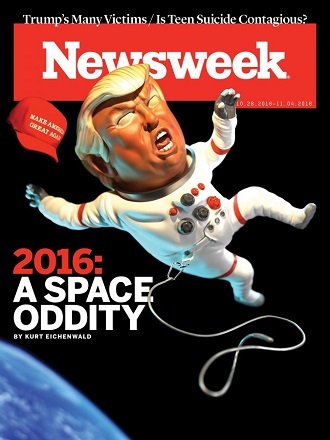 But if Trump voters are angry, that doesn’t mean they’re crazy. You meet more state representatives and business owners at his rallies than tinfoil-hat conspiracy buffs. In ways, they are a vanguard, catching sight of a new style of politics and deciding early to throw out the old rules. Their radical democracy helps account for Trump’s uncanny resilience: the less he honors the conventions of politics, the more his supporters like him. They aren’t buying what the political process is selling. They want to buy direct from the source. 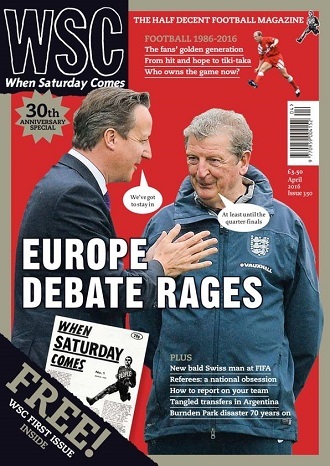 Tidskriftsomslag: Time, 18 januari 2016. KÄNDISAR | Den gamla humbugen Karl Marx hade inte helt fel när han hävdade att historien upprepar sig först som tragedi och sedan som fars. Vem hade t.ex. kunnat gissat att Donald Trump idag skulle vara republikanska partiets frontrunner? Och i år, under sitt plattityd fyllda tal under MTV:s Video Music Awards, meddelade Kayne West att han tänker ställa upp och kandidera inför presidentvalet 2020. If my grandfather was here right now, he would not let me back down. I dunno what I fittin’ to lose after this. It don’t matter, though, because it’s not about me. It’s about ideas. New ideas. People that believe in truth. And yes, as you probably could’ve guessed by this moment, I have decided in 2020 to run for president. 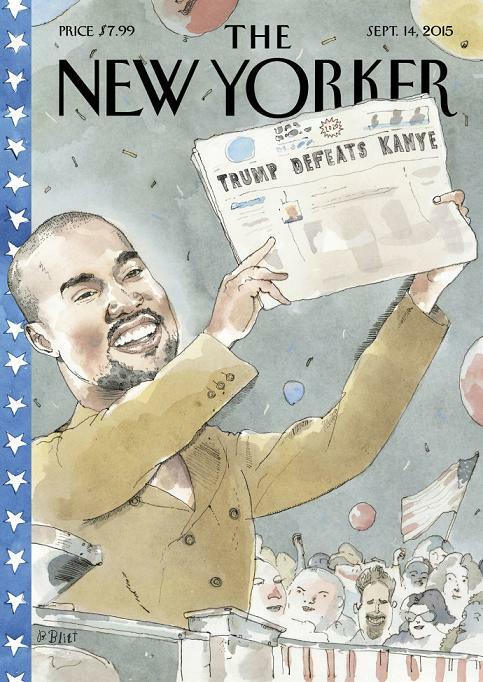 Barry Blitt spann vidare på detta när han tecknade omslaget “2020 Vision” för The New Yorker. 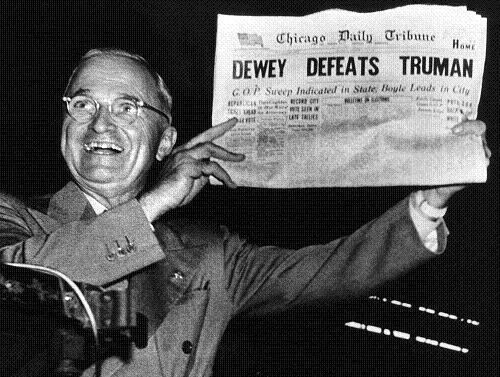 Inspirationen hämtade han från Chicago Daily Tribune som, baserat på tidiga siffror, felaktigt förespådde att Thomas Dewey skulle besegra Harry Truman i valet 1948. 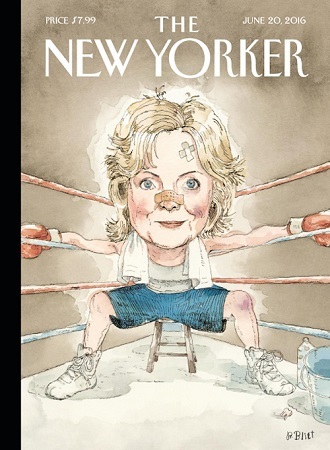 Tidskriftsomslag: The New Yorker den 14 september 2015.